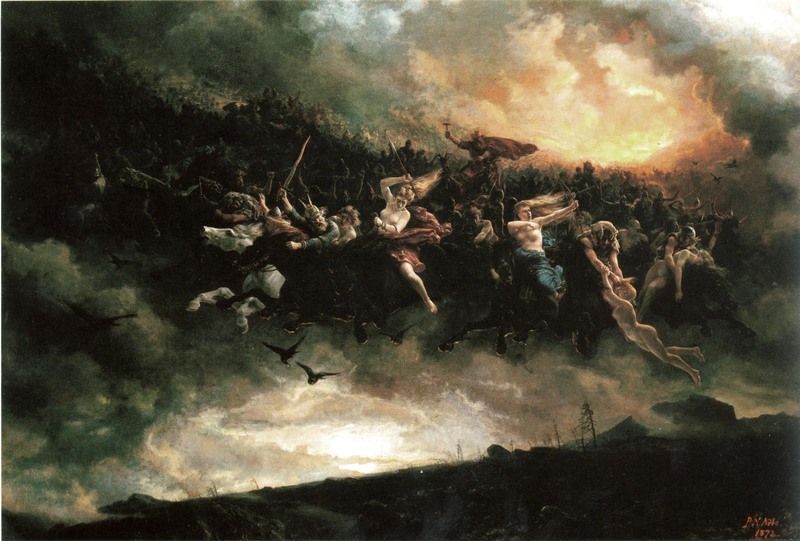 Reading the various engaging Samhain articles around the blogosphere today, I find it curious that almost nowhere do I see mention of The Wild Hunt. In fact the only place I find it mentioned is in John Halstead’s article, “What in Sam Hain“. I share Halstead’s sentiment in that October 31st has never been a day in which I’ve felt inclined to engage in somber ancestor worship. This night has always felt like frenetic chaos to me, with the secular world caught up in a whirlwind of loosened boundaries and intoxication rivaled only by New Year’s Eve. I view this night akin to a rip current in the ocean: if I decide I want to take a swim I had better be prepared to go wherever the current takes me, because fighting against it will likely lead to drowning. And I think that’s wholly appropriate for a night that marks the beginning of a cycle where, whether real or due to our own shift in perception, the boundary between this world and the otherworld thins, allowing for the possibility of communion between the denizens of each. In my own belief of this time it’s the wild hunt which blows through that boundary at the first, marking the path for those who follow, creating a rip current with its passing. The hunt leaves in its wake flotsam and jetsam that is quite manifest, as anyone who works in an emergency room can likely attest. While we can assume that any holiday where drinking factors heavily will result in increased violence and accidents, Halloween night seems to be a particular catalyst, above and beyond even New Year’s Eve. The statistics in the article linked above are for Boston only; I’d be interested to see how they compare to the national average. If the Halloween riots in Madison, Wisconsin are any indicator, there does seem to be a pattern. The wild hunt is a force of nature. It’s beautiful, frightening, dangerous. It reminds us of how vast, unfathomable and utterly magnificent the scope of the universe is. Deny it or treat it lightly and the hunt may decide you are the game – and leave you at the bottom of the ocean. Acknowledge and give it your due respect, approach it with your eyes open, and maybe, just maybe, you can ride along with it.